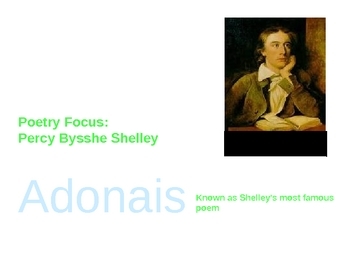 Professional and aesthetic Power Point analyzing the first three stanzas of Percy Bysshe Shelley's "Adonais"- great for an entire class period and student note-taking. In-depth analysis of poetic techniques and multiple Greek allusions. Makes poetry analysis fun and easy when you have the right tools! Perfect for AP Literature and Compostion or a high-level poetry study in an Honors class.